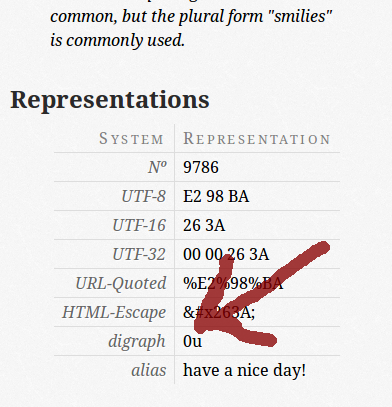 Some codepoints show a mysterious line in the “Representations” section called “digraphs.” What does that code mean? It’s a way to enter this character with only an easy to memorize set of ASCII letters. Many digraphs are standardized in RFC 1345, and you can use this technique in several editors and environments. The Wikipedia knows the details. A single digraph is composed of two (or sometimes more) ASCII characters and represents uniquely a certain Unicode codepoint. For example, the digraph AE represents the Unicode codepoint U+0198 (LATIN CAPITAL LETTER AE): Æ. To distinguish digraphs from regular ASCII characters some introducing has to occur. In Vim, the famous text editor, the Ctrl-K sequence starts the digraph entering mode. You can try digraphs online at this digraphs demo page. In a short time you will become adicted to the editing power of them. There is a Firefox addon to enter digraphs in your favorite browser. It is written by me, but I must admit, that it lacks several features at the moment. In most environments it works as advertised, but it isn’t as stable as I wished it to be. If you happen to know some bits about Firefox addon development, please get in touch. I’d love to hear from you how to improve the addon.